Washington, DC – Forecasters at the National Oceanic and Atmospheric Administration’s (NOAA) Climate Prediction Center released the U.S. Winter Outlook today, with La Nina potentially emerging for the second year in a row as the biggest wildcard in how this year’s winter will shape up. Private weather forecaster Accuweather agrees. La Nina has a 55- to 65-percent chance of developing before winter sets in, NOAA forecasters indicate. Other factors that influence winter weather include the Arctic Oscillation, which influences the number of arctic air masses that penetrate into the South and is difficult to predict more than one to two weeks in advance, and the Madden-Julian Oscillation, which can affect the number of heavy weather events along the West Coast. For the period December through February, NOAA predicts wetter-than-average conditions across most of the northern United States, extending from the northern Rockies, to the eastern Great Lakes, the Ohio Valley, in Hawaii and in western and northern Alaska. Drier-than-normal conditions are most likely across the entire southern U.S. At the same time, warmer-than-normal conditions are most likely across the southern two-thirds of the continental U.S., along the East Coast, across Hawaii and in western and northern Alaska. Below-average temperatures are favored along the Northern Tier of the country from Minnesota to the Pacific Northwest and in southeastern Alaska. Despite the outlook favoring above-average precipitation this winter, NOAA predicts that drought is likely to persist in parts of the northern Plains, although improvement is anticipated farther West. Elsewhere, drought could develop across scattered areas of the South, mainly in regions that missed the rainfall associated with the active 2017 hurricane season. 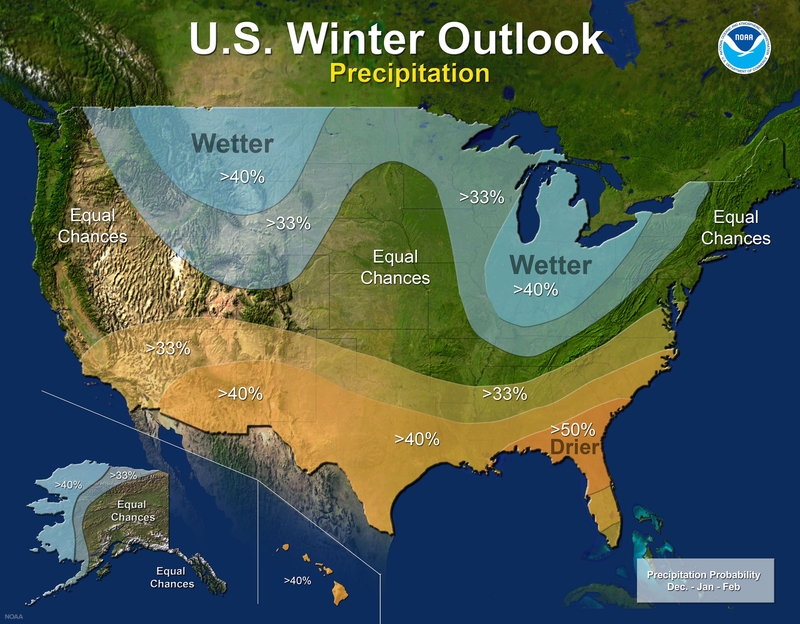 NOAA’s seasonal outlooks give the likelihood that temperature and precipitation will be above-, near, or below-average, and also how drought is expected to change, but do not project seasonal snowfall accumulations. While the last two winters featured above-average temperatures over much of the nation, significant snowstorms still impacted different parts of the country. Snow forecasts are generally not predictable more than a week in advance because they depend upon the strength and track of winter storms. 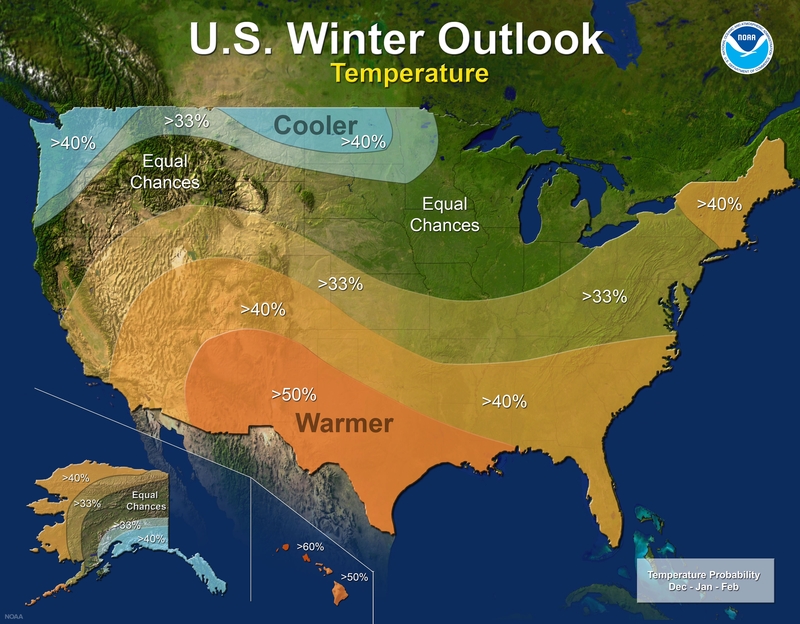 NOAA will update its U.S. Winter Outlook on November 16. 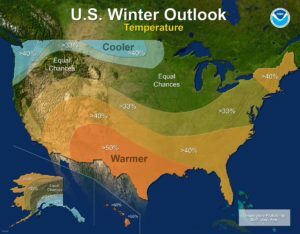 Private forecasting firm Accuweather agrees that a La Nina pattern is likely to emerge with the start of winter. In its U.S. winter forecast released earlier this month, Accuweather predicts that some chilly winter weather is in store for the Northeast and mid-Atlantic, with January threatening to bring the coldest air of the season. 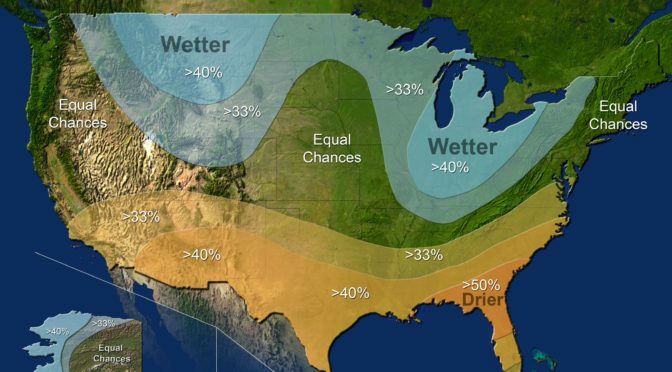 Although however cold, low temperatures will pale in comparison to those in the northern Plains where the mercury is set to dip to minus 30 degrees Fahrenheit at times, while the southern Plains, Southwest and California can expect a milder and drier winter than last season, according to Accuweather. New York City and Boston, Massachusetts, may be the exceptions to this, according to Pastelok, with early predictions calling for six inches of snowfall or more above normal in both cities. Areas prone to lake-effect snow will also see high totals, including Cleveland, Ohio; Erie, Pennsylvania; and Buffalo, New York. Pastelok expects Arctic blasts to freeze the northern Plains this winter with temperatures sinking to subzero levels on a regular basis. However, the frigid conditions are a trade-off for less snowfall. The winter of 2016/2017 spawned colossal storms, dropping 140 percent of normal snowfall over the northern Plains and northern Rockies, according to Pastelok. This year will feature much less snow and drier conditions overall, he expects. Predicting a weak La Nina to develop this winter, Pastelok predicts an abundance of precipitation to blanket the Northwest and the Rockies. “I think the Bitterroot chain all the way down to the Wasatch region in the central and northern Rockies has a good shot to be above normal on snowfall this season,” Pastelok said. The Cascades are also predicted to benefit from abundant snowfall. “It’s a good area to head out to if you’re a big skier,” Pastelok said. But after a big season for snowfall in central and Northern California last year, Pastelok predicts both regions to be less wet and snowy in the upcoming months. However, it won’t spell bad news for ski season, as ski resorts will receive enough snowfall to create good conditions, but not so much that people struggle to get to them, he said. In the Southwest, Pastelok expects that drier and warmer weather will dominate.